Despite interest in 5G, Ericsson does not seem to anticipate much growth in that market over the next four years. Dell'Oro, a research company Ericsson cites in its latest earnings report, expects overall RAN sales to rise at a compound annual growth rate of 2% between 2017 and 2022. Ericsson could always beat this forecast: For the third quarter, it reported a 5% organic increase in network sales, against Dell'Oro's projection of a 2% market decline for the full year. Yet Ericsson also warned investors last year that its overhaul will reduce total sales by SEK10 billion ($1.1 billion) in 2019, an amount equal to 4.5% of the sales figure for 2016. This all points to a future as a smaller but more profitable company. In fact, Ekholm's plan could make Ericsson look rather like it did in 2010, when sales were SEK203.3 billion ($22.5 billion) and a margin of 12% delivered an operating profit of SEK24.4 billion ($2.7 billion, excluding any joint venture activities). 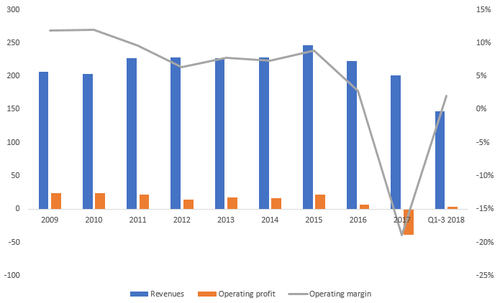 The danger for Ericsson is that a technology shift, combined with a series of regulatory and competitive challenges, portends the start of a long decline. Ericsson, in other words, may be about to peak. 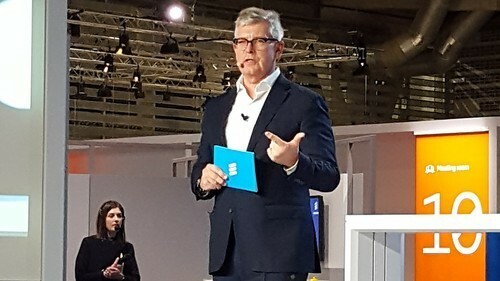 Ericsson's Börje Ekholm has restored profitability at the Swedish vendor.